Motherwell failed to take advantage of results elsewhere after suffering a controversial 3-2 defeat at St Mirren Park this afternoon. Henri Anier and John Sutton took advantage of space in the St Mirren defence to put Motherwell two ahead inside 27 minutes. But, with Motherwell missing injured centre-back Shaun Hutchinson, St Mirren looked dangerous at corners and Steven Thompson converted one just before the break to give the Buddies hope. They pressed in the early stages of the second half but Motherwell had chances on the break and appeared to have withstood the pressure. However, stand-in referee Iain Brines awarded the hosts a controversial penalty for handball by Stephen McManus in the 86th minute. Thompson’s header hit the former Scotland defender’s face at point-blank range but Brines, after some hesitation, decided it was deliberate handball despite the Motherwell defender’s protests. Kenny McLean converted from the spot and Thompson stunned the visitors when he turned and fired home from close range a minute later. Both teams made changes from matches against Inverness. Saints replaced Wylde and Campbell with McAusland and McGowan whereas McCall was forced into one switch, Hutchinson missing out only to be replaced by Lionel Ainsworth. 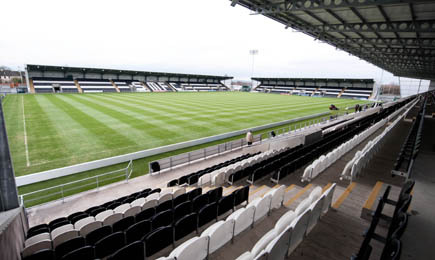 St Mirren had the first chance when Darren McGregor won McLean’s corner but Gunnar Nielsen got down well to stop. Sutton headed just wide from a Craig Reid cross at the other end and Motherwell were ahead in the 16th minute after St Mirren were caught out by a diagonal ball from McManus. Lionel Ainsworth had yards of space to run into and he squared for Anier to stroke home after Saints goalkeeper Christopher Dilo rushed out unconvincingly. Saints lost Paul McGowan to injury in the 22nd minute as Gregg Wylde came on, and they missed a great chance to equalise when Jim Goodwin sent a free header wide from six yards following another McLean corner. Motherwell punished them two minutes later to double their lead after probing for an opening on the edge of the St Mirren box. The home defence was again stretched as Steven Hammell crossed and Ainsworth volleyed the ball across the face of goal for Sutton to stoop and head home. The Saints defence was soon exposed again as Reid broke down the right to cross but Jason Naismith got across to cover and divert Sutton’s shot wide. But the hosts continued to look dangerous whenever they got a corner and Thompson headed not far over before he pulled one back in the 41st minute. McGregor headed back McLean’s deep delivery from the right and Thompson swept the ball home with his left foot from 10 yards. Fourth official Brines replaced Euan Norris as referee at half-time and the pattern of the game changed as well as the home side pushed for an equaliser. Naismith fired several dangerous balls across the face of goal and Thompson had a series of efforts, including a diving header and a shot on the turn that Nielsen both saved well. Saints brought on striker Josh Magennis for midfielder Conor Newton but Dilo kept them in the game when he acrobatically tipped Ainsworth’s 20-yard strike over the bar. Saints survived another major scare when Craig Moore beat the offside following Sutton’s pass, moments after replacing Anier, but he snatched at his shot when clean through and dragged it a yard wide. And Motherwell were made to pay for the miss in a dramatic finale as St Mirren climbed above Partick Thistle and consigned Hearts to relegation. 82mins: Free-kick to ‘Well just inside the St Mirren half. McManus slides it into Moore who releases Francis-Angol but his cross…. 28mins: Could have been 3! Great work from Reid to get down the wing and deliver for Sutton who is just beaten to it by McGregor. Corner. “A long ball came at the back post and the ball hits Stephen in the eye socket and the bridge of the nose and flies out to the edge of the box, and the crowd shout. “The linesman, who is looking right at it 12-15 yards away, nothing. The referee, from I think 30 yards away at the other side of the box, gives a penalty. “Stephen doesn’t rant and rave about things. He is an honest guy. Obviously his arms are up when he has jumped but it has hit him flush in the face. “I haven’t had the chance to see it but if we have got that bit of fortune, then the only thing I can say is that it’s overdue. “I did think we could get back into things because, bizarrely enough, I thought it was against the run of play that we conceded two goals. “I’m very disappointed in the manner we conceded the two goals and that’s why we have been flirting at the bottom of the table because we leave the back door open. “But at set plays we always looked a threat, McLean’s deliveries were superb. We managed to get the goal at the right time and that lifted us. Concessions are listed as Over 65s, Under 18s and FT Students with a valid matriculation card. Junior tickets are listed as 12 and under. There is engineering work on the railway line this Saturday and as such, trains will terminate at Paisley Gilmour Street (Paisley St James, the next station, is where supporters would normally change for St Mirren’s ground). Fans should therefore allow extra time for this when travelling to the match. There is likely to be extra buses for the outward journey, however it will not be possible for the return portion due to parking restrictions. There will be buses from Paisley St James to Paisley GS to replace trains but they will not run at scheduled times and may be busy on arrival. It is approximately 15 minutes walk between Paisley Gilmour Street and the football ground. St Mirren have adopted a new entry process for the away Support, this has been in operation when clubs who bring larger supports to new St Mirren park. The Motherwell Support will be directed to enter the stadium past the left hand side of the dome. Access to the ticket office is at that end. They will be directed along the side of the dome to turnstiles T17-T20 where they will gain access. The access from the right of the dome will be blocked and supporters will be directed around the dome to the left side. The police/stewards will operate random searching at the turnstile so there may be delays getting in to the ground. Police dogs will be deployed looking for fireworks and smoke canisters. Young defender Fraser Kerr hopes to put his injury nightmare behind him and help ‘Well qualify for European football. The former Birmingham right back has had zero luck with an endless list of injuries putting pay to the majority of his season. However, after working extensively with John Porteous and Adam Stokes, the 21-year old now has his sights on a regular starting role. “It’s been a hugely frustrating season for me on the injury front,” he admitted. “With both Simon Ramsden and I out injured for a long period, we’ve had to bring in Craig Reid, who has performed very well. “You can imagine how annoying it was to be on the sidelines when you know you could’ve had a chance to impress. “So to finally get back amongst it on Tuesday night, play the full ninety minutes and get through it unscathed is a really good feeling. Getting the assist for Henri’s goal was excellent for me too. Drawing on the experience of previous matches against Saints, ‘Well boss Stuart McCall is certain his side will have it tough in Paisley. Danny Lennon’s side always prove tricky opposition for the Fir Parkers with the stats showing very little to choose from when the teams come up against each other. ‘Well have shaded it this term with a 1-0 win in Paisley back in September and a 3-0 win at Fir Park before Christmas. But with the injury situation at Fir Park showing no signs of relenting, the Motherwell boss knows his side will have to be at their absolute best to take anything from the match. Speaking to the gathered press at Motherwell’s pre-match news conference, McCall said: “We managed to beat earlier in the season and did okay with the performance at Fir Park back in December was much better. “Saints have the likes of McGowan, McLean and McGinn who can, on their day, open teams up and that, coupled with the good experience of Goodwin, Thomson, McGregor and Teale, they’ve got a really good group of players. “They’ve maybe not quite got the points total that I thought they would amass but they have been unlucky at certain times and might feel as if they should have more on the board. “From our point of view, we have the same five players that missed the match at Inverness still out. We’ll also have three others facing late fitness tests tomorrow morning so that’s meant we’ve been unable to shape up today. Fir Park will host Scotland Woman’s latest World Cup 2015 qualifier when Poland are the visitors this Saturday. Anna Signeul’s side are currently sitting top of their qualifying group, with four wins from four matches against Faroe Islands, Bosnia, Northern Ireland and Poland, scoring twenty goals. They now face the Poles again looking to consolidate that position, before a midweek away match against Bosnia. Tickets for the big match are available on the gate price at £5 for adults and £2 for concessions. Both the Phil O’Donnell and East Stand will be open and there is a Youth Group Offer of five Adults and two Under 16 for £30. To take advantage of that, please contact contact Wendy at the MFC Ticket Office [Click Here to Email] prior to 2.30pm on Friday. Motherwell FC is proud to have signed for ‘Men United’ in the fight against prostate cancer – a unique new campaign from Prostate Cancer UK. With prostate cancer affecting 1 in 8 men in the UK and the death rate increasing at an alarming rate, Prostate Cancer UK aims to reach millions of fans, players and staff, by raising awareness of prostate cancer and encouraging men to wise up to the disease and take action. Men United v prostate cancer aims to unite the football community and create a new movement for change in men’s health. Recent signing Craig Reid added: “Men tend not to open up about difficult health matters, preferring to talk about the weekend result instead. The fact is that as we all get older the prostate can become a problem, so we all need to face up it and be aware of the risks. Stuart Carswell added said: “I am proud to sign for ‘Men United’ with the rest of the lads to support the most common cancer in men in the UK. To take the test – sign up at www.prostatecanceruk.org/menunited! 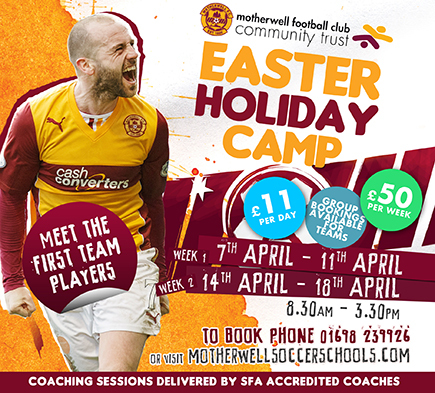 Youngsters aged 5-14 are bring urged to get fit and healthy, improve their football skills and have fun by taking part in the 2014 MFC Community Trust Easter Holiday Camp. The Camp will be held on the Fir Park Astroturf from 7th-11th April and 14th-18th April. Running from 8:30- 3:30 each day and delivered by SFA accredited coaches, sessions will focus on a range of skills such as shooting, passing and dribbling. Kids will then have the chance to put their new skills into practice through penalty competitions and small-sided games. First team players will also be attending to offer pointers and advice to the McFaddens, Hammells and Lasleys of the future. Steelmen boss Stuart McCall said: “The Community Trust do a terrific job with the holiday programmes and every time they come around, we are delighted to get involved. Limited places are available at £11 per day and £50 per week. Group bookings are also being taken. Further information on times, a detailed breakdown on what you need to bring with you as well as bookings phone the Motherwell Football Club Community Trust on 01698 239 926 or alternatively visit www.motherwellsoccerschools.com. Extended highlights from Excelsior Stadium as goals from Fraser Johnstone and Paul McCafferty give ‘Well a 2-0 win over Inverness CT.
Jonatan Johansson was pleased with his side after their comfortable 2-0 win over Inverness this evening. The Steelmen controlled proceedings for the majority of the match and were rarely tested by the Highlanders. The hosts got themselves ahead after 29 minutes when Frazer Johnstone lashed home his first of the season, before Paul McCafferty doubled the advantage ten minutes into the second half. ‘Well could have added more goals but had to settle for a routine 2-0 win that puts them back to fifth in the Under 20s table. “I am pleased with lots of things this evening, particularly the clean sheet,” Johansson told MFC TV after the match. “I thought defensively we were good and restricted them to very few shots across the ninety minutes. We passed the ball well, particularly in the second half, and got a couple of good goals. “When we got ourselves in front, I felt we controlled things and turned in a very professional performance and it was comfortable for us. A goal in either half gave ‘Well a comfortable 2-0 win over Inverness Caley Thistle Under 20s this evening. Frazer Johnstone grabbed his first of the season with a stunning volley on the half hour. Paul McCafferty added a second goal ten minutes into the second period with a close-range header. And although the home side had more chances to extend their advantage, they cruised through for a comfortable win. Jonatan Johansson made three changes to the side that lost to Dundee United fourteen days ago. Ben Hall, Luke Watt and Craig McCall dropped out and were replaced by Danny McNulty, Euan Murray and Dom Thomas. Inverness made a decent start and had a couple of shots through Matthew Cooper and Adam Evans, but neither troubled Brett Long in the home goal. It took the Steelmen seventeen minutes to register any sort of effort of their own but, like his counterparts from Caley, Steven Higgins’ shot lacked the desired power and was comfortable for Cammy MacKay to gather. Four minutes later, Euan Murray had the ball in the net after bulleting home a Dom Thomas corner, but referee Peter Stuart ruled it out, adjudging the defender to have illegally manhandled Cooper. ‘Well were starting to get the upper hand as the half-hour approach and after neat interplay between Higgins and Thomas, the latter’s shot was blocked for a corner. From the resulting kick from the quadrant, Johnstone was first to feed on the scraps on the edge of the area and unleashed an unstoppable volley high into the roof of the net to give the hosts a lead. Four minutes later and the Fir Parkers almost doubled their lead. Morgyn Neill’s ball over the top had Dale Shirkie in on goal, but when the ball didn’t drop, he scooped his effort high over the bar. Before the break, Inverness had a half chance when Adam Evans got in behind Danny McNulty to get on the end of Evans’ pass, but could only prod over. Down the other end, Thomas had a decent chance from a close-range free kick but could only fire it straight at MacKay. ‘Well started the second period on the front foot and Higgins posted early intentions with a fierce strike that went narrowly over. It was a warning the Highlanders failed to heed as, with their next attack, Johansson’s men doubled their advantage. Thomas and Higgins again combined and when Higgins whipped in a teasing near post cross, pint-sized winger Paul McCafferty had made a clever run across his marker and headed home from close range. ‘Well spent the rest of the match in almost complete control. Murray again came close to netting when he met another Thomas free-kick, but his header went wide of the post. Cadden had a long-range strike palmed out by MacKay after lovely build-up play through the middle of the park and Dom Thomas almost scored the strike of his life, jinking past the whole Caley backline only to be denied an astonishing goal by a sliding block at the expense of a corner. Then, with thirteen minutes left, Dale Shirkie thought he had scored ‘Well’s third but after dancing around a number of challenges, he smashed his shot off the crossbar. Murray headed a corner wide and Thomas had another shot blocked after a good run as the Steelmen finished the game on top, but failed to add to their lead.